For Christmas, my gift to Seth was a surprise trip to Hawaii! Its one of my happy places in the world and he has never been. I planned the whole thing out months in advance and had a hard time not spilling the beans. He was definitely surprised! But ensured that in the future we would discuss trips like this together before booking.. I picked Oahu because there are a ton of spots that I really wanted Seth to see in person.. such as visiting the historic Kualoa Ranch, surfing in Waikiki and of course hiking all the beautiful views! Here's a recap of our time spent there! We arrived in Honolulu and took a Uber to our hotel, we stayed at the White Sands Hotel in Waikiki. Since we're definitely traveling on a budget, I picked the cheapest (and cleanest looking) hotel that I could find. I'd give it 3/5 stars. Nothing special but all we needed was a place to sleep for the night and it gave us just that! After dropping our stuff off in our room, we found a quick place to eat since we were starving! (Hawaii and California have a 3 hour time difference). I'm a professional yelper, but nothing in the area near us sounded good so we just stopped in some grocery cafe. I tried Poke for the first time and it was yuck. I always thought I'd be a fan though! We then headed straight to the beach and rented a tandem surfboard (12 feet) and tried surfing in town. I wish we would have just got our own separate boards because we could not catch anything. I felt super sad because I really wanted Seth to enjoy surfing while we were there. Thats the whole reason we came to Oahu! But the water was beautifully clear and I love being out in the water on Waikiki because theres a beautiful view of Diamond Head there. Honolulu/Waikiki definitely is NOT where you should spend all your time while in Oahu, its very very touristy and city like.. but I do like it for a few hours or so! Our dinner that night was the granola bars that we had packed in our bags, (traveling on a budget) and we went to bed early that night. In order to get to the North Shore from Waikiki, you can either take the bus or take a Uber. There wasn't much of a time difference (since there is only one main highway road to get there, and since a Uber would cost us upwards of $100 and the bus would only be $2.25 each, we took the bus. The driver was super kind to let us carry all of our stuff on and on our laps. Its a beautiful drive from town to the North Shore. You first travel through a tunnel and get an amazing view of these deep green and dramatic mountains, then the rest of the ride is right along the ocean. It takes about 1.5 hours. I was most excited about the car we rented while visiting. My friend Lauren and her Husband Tanner run a business called Hotelement, they converted their Honda Element into a little camper. The back seats are taken out and they installed a super nice bed in the back. Its definitely the cheapest way I found to stay in Oahu. Because your car and hotel is all wrapped up into one price. Some people may think we are crazy but hey this is the type of thing you can do while you're young and childless! Hahaha. Tanner was an amazing host and I couldn't be happier with our experience with Hotelement. Tanner helps you out with all your questions and concerns. He's your go-to guy with recommendations of what to do, where to go and what to eat. He gave us a map of the island of where to park the car at night for camping, where to surf and where to hike. It was super helpful! We got ourselves situated into the car and headed more North. We stopped at Teds Bakery for some breakfast. I always get recommended this place but have never been blown away both times I've stopped in. We then headed to Waimea Bay. We had the best time throwing ourselves into the huge waves (like seriously, they're huge be careful) the water here is beautifully blue and extremely clear. We played in the water for awhile and then took a break to walk along the beach. Theres also a large rock that people jump from into the water. I am glad Seth didn't really care about doing it because I haaaate jumping off things like that! Like I mentioned earlier, surfing was the #1 reason I wanted to bring Seth here, #2 was to be able to collect sea glass. He's grown quite a collection the last few months and I knew Hawaii was a great place to hunt. We found dozens and dozens of pieces here (which is kind of sad because while beautiful to us its technically litter!). And in just a couple minutes of searching we already had doubled the amount of sea glass that we had been collecting for months back at home. We then decided to save our parking spot and walked over to the area where all the yummy food trucks are at. We chose the North Shore Shrimp Truck. Seth got the garlic shrimp and I ordered the lemon shrimp. Its expensive (like $13 each plate) but so so so so so yummy. Food is expensive no matter where you go on the island so just expect that. After lunch we took a nap in our car on the comfy bed! We explored a little more around Sharks Cove. For sunset we just enjoyed it sitting on the beach at Sunset Beach (or at Pipeline, I can't remember which is which). It was dark by the time we had to find a parking spot to sleep for the night, but we decided to go to the very most western tip of the island called Kaena Point State Park. All the way out there there was zero light pollution so the stars looked beyond amazing. I've always wanted to try night photography and it was an amazing spot for it. I also love it when Seth gets excited about photography and he was loving the shots we were getting. We woke up early but it was cool because since we got to our camp spot when it was dark, our surroundings were a surprise to us. It was so beautiful to have the tall green mountains to our right and the ocean to our left. Seth looked up the history of Kaena Point and apparently thats where the Hawaiians believed that the spirits would go and jump off the mountains there. Luckily I didn't know that before went!! We went to get acai bowls at a place called Haleiwa Bowls. Perfect Acai bowls! Our plan was to go Shark Diving that morning. My friend Nick works for one of the companies as a photographer and was soooo nice to help us plan it! I was so excited to go out but unfortunately it was a little windy that morning so we couldn't go out :( Definitely a bummer! But its all good! It started raining and we didn't know really what to do. We decided to drive around exploring the north shore. We then got a call that our car had been broken into (they smashed our window) and so that stress definitely put a damper on everything! Luckily I had cleaned out the car before we left so there was nothing valuable that they could take! We decided to go on a hike and attempted to go on the Crouching Lion hike. I've alllwaaaays wanted to do this hike because it has AMAZING views. Sadly we coulnd't find it. We followed the directions that we found online to a T but ended up on the wrong trail. I don't know what hike we went on but I really thought we would die. Like 60% sure hahaha. It was crazy windy where we were and the trail on top was so narrow. Luckily we made it out alive. I know I sound dramatic but it really was intense! Like we had to hold onto a rope for the majority of it. Okay I'm done haha. For dinner we went to Elephant Shack, a Thai restaurant that came highly recommended. But I don't recommend it. The food was sub par and the service was really bad. Hawaii is definitely not a foodies paradise haha. Our last full day! By now we were pretty tired and gross. The only disadvantage of the Hotelement is not being able to take a real shower for a few days. Other than of course jumping in the ocean! Our first stop of the morning was to Kuaola Ranch. (Well first we got acai at Haleiwa Bowls again) I had been here before on a horseback riding tour and its one of my favorite memories ever! I knew Seth hated horses so when I booked a tour here I decided on the ATV tour instead. This was one of the big highlights of the trip! Kuaola has amazing history with Hawaiian culture that I love to learn about. This tour didn't focus as much on that as it focused on the movies/t.v. shows that had been filmed here. The tour was 2 hours and we got to go through the whole valley. Its really an awesome and beautiful place. Afterwards, we went to Laie and visited the LDS temple there. Its a really beautiful and sacred space. Normally I don't do this but we went into the visitors center and got a tour. Its a really good one! We went across the street and visited Laie Point and took some pictures there. Then we headed to lunch at Kahuku Farms. Seth wasn't a huge fan but I was. They grow all their own food at the farm where the restaurant is located. We ordered the veggie sandwich and the smoothies. THE SMOOTHIES! Out of this world! So so good. Worth it to come just for those. We had to get in another surfing day so we headed to Haleiwa. The spot we went to was super super fun! Everyone was really nice to us. There were a few locals who would give us pointers on where to paddle to catch the best wave and just super super nice. Very aloha of them hahahahahaha. We rented our boards from Uncle Bryan, he runs a surf school actually and doesn't normally rent out boards but I remembered renting from him last time I visited so he was really nice. I'd love to hear a little more about his story because theres something really fascinating there I can tell. We stopped at Matsumoto Shave Ice for the second time. I'm positive there are probably other places around that are just as good if not better and not as tourist but it is just soo good that I didn't want to take a chance and ruin a good thing. For dinner we stopped at that place on the north shore where we had gone before for the shrimp plates. I tried to go back to North Shore Shrimp Truck but they were only taking cash by then. I decided to walk over to Aji Limo Truck instead and see what they had. North Shore Shrimp Truck was packed but no one was over at this place. I ordered the Sunset Special and oh my gosh. That was the best meal I ever had. Seriously. I would travel back to Oahu and eat this every day. It was raining really hard this night and I wanted to camp on the West side of the Island this time. 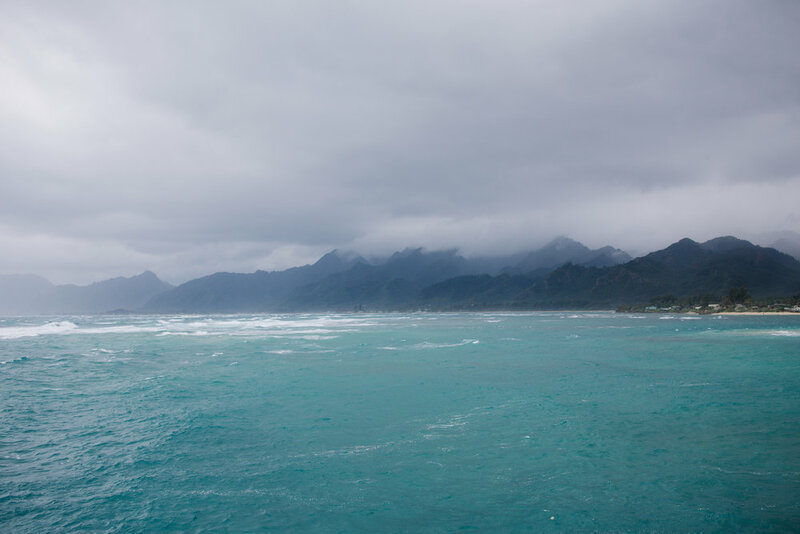 Unfortunately since it was raining so hard we didn't feel safe driving through the mountains to get there so we just went to Kaena Point again since we had such a nice time before there! We had a lazy morning this day. We dropped the car back off in Laie and took the bus back to Waikiki. We stopped for lunch at Kan Zaman since it was something different than we had tried before and it was close to our bus transfer. It is in a really really weird part of town but seriously yummy. After a bus ride and a long long walk (I accidentally had us get off two stops too early) we made it to the airport and on the plane! I love Hawaii. I don't think we deserve to have it as part of America honestly (sorry to get political but we were researching about how it became part of the U.S. and it just seems sad!) but we are really lucky to have it as part of the U.S. because its like traveling to a beautiful new country but without all the hassles of going abroad. We had such a fun adventure! Emphasis on the adventure haha. We went without a lot of luxuries for this trip but being able to have so many incrdeible experiences was the best! Its all about the memories!